The famous question that Ronald Reagan put to voters in the waning days of the 1980 election was an implicit theme of the Republican National Convention in Tampa, Fla. — and it has received further play since then on the Sunday morning talk shows and on the campaign trail. It’s a smart question for Mitt Romney’s campaign to be asking, and one that President Obama needs to develop a better answer to. Still, it’s probably best not to take the question literally. If voters did, Mr. Reagan might never have been elected. There was actually quite a bit of jobs growth during this four-year period: about 10 million jobs were added to the economy, in fact. 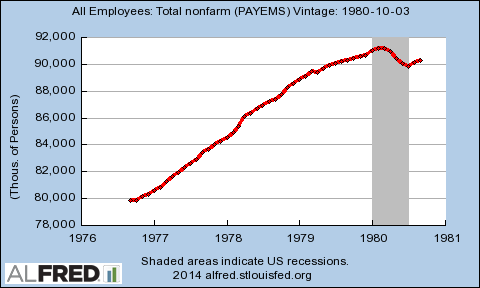 The first two years of Mr. Carter’s term, 1977 and 1978, were particularly robust years for employment. But the economy began to slow down in 1979 and was in acute crisis mode by 1980, having lost about 1.5 million jobs from its previous peak. The economy technically came out of recession late that year, but there was enough of a hangover from the summer that Mr. Carter was doomed to be a one-term president. But were voters better off than they had been one year ago? That question had a more straightforward answer: probably not. And that’s why so many of them voted for Mr. Reagan. 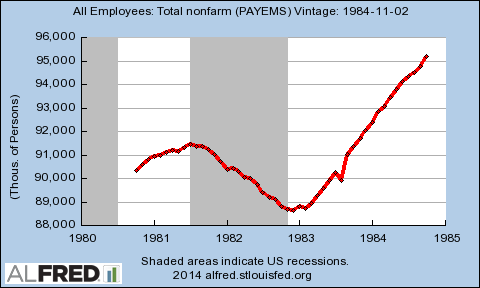 The economy certainly improved on balance under Mr. Reagan — there were about 95 million payroll jobs in the country when voters went to the polls in November 1984, as compared with about 90 million four years earlier. Still, that was only about half as many jobs as were added in the four years leading up to Mr. Carter’s losing election night in 1980. What mattered, of course, was the trend: Mr. Reagan had gotten his recession out of the way early. From an employment standpoint, the recession of 1981-82 was actually more severe than the 1980 one: about 2.5 million jobs were subtracted. But jobs growth in 1983 and 1984 was pretty awesome; about 250,000 jobs were added to the economy each month as reported in real time. These two back-to-back election cycles represent the most emphatic examples of a point that macroeconomic forecasting models are absolutely agreed upon: it’s recent economic performance that matters. Another case is 2004, when George Bush the younger was in office. 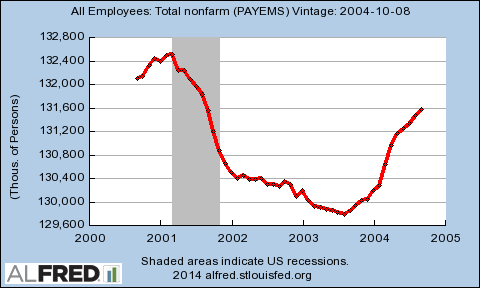 Through mid-2003, the economy had actually lost quite a lot of jobs, about four million, based on the real-time numbers. But it picked up just in the nick of time, adding about 150,000 jobs per month in the final 12 reports published in advance of the election. That was enough for Mr. Bush to win a narrow re-election — despite the economy actually having shed jobs from four years earlier (as well as from the date of his inauguration in 2001). The last four years of jobs numbers don’t look exactly like any of these cases. For one thing, it matters quite a bit exactly what you mean by “four years,” since the economy was in free-fall in late 2008 and early 2009. 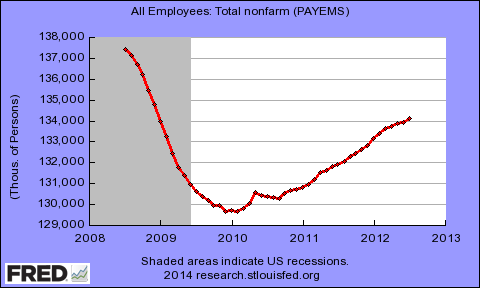 As compared with July 2008, there were about four million fewer jobs in the economy as of July 2012. Of course, Mr. Obama might object that he is being blamed for job losses under Mr. Bush. If you start his clock as of his inauguration in January 2009 instead, the economy is fairly close to having made up the jobs it lost — the last three jobs reports before this November’s election will determine whether it clears that hurdle. Or, Mr. Obama might prefer voters to focus on jobs growth since the recession officially ended in June 2009. Since that time, about 2.5 million jobs have been added. 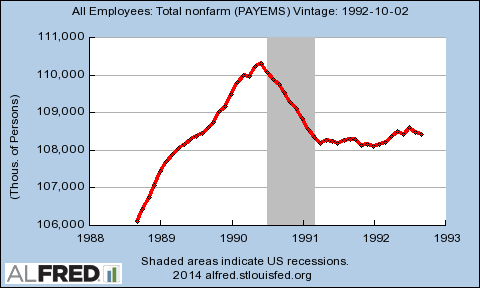 Still, the job growth has been tenuous: nowhere in the ballpark of what Mr. Reagan produced, certainly. There’s never even been a moment in Mr. Obama’s tenure where the term “good” could aptly be applied to describe the economy. 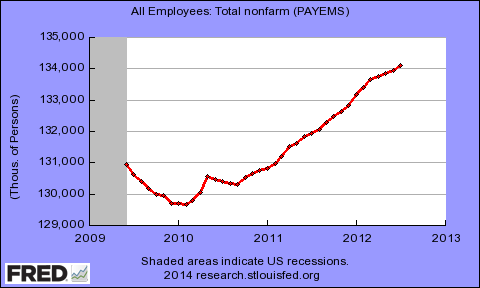 But there has been some jobs growth: quite a bit more than under the elder Mr. Bush. Instead, 2004 is probably the least imperfect precedent. In the past 12 employment reports, the government estimates that an average of 153,000 jobs have been added each month, similar to the pace of jobs growth in late 2003 and 2004. But Mr. Obama’s fate could hinge on the last three months of jobs numbers — including the report on Friday, which will come the morning after his speech to the Democratic convention in Charlotte, N.C.
Talk about accidents of timing: Mr. Obama’s words in Charlotte are suddenly going to seem a lot more inspired if the next morning we find out that 200,000 jobs had been added in September. If the employment report is a dud instead, his speech will seem much emptier, both to pundits and to voters. But it will be the recent news that they are thinking about — not what happened four years ago. The question that voters have been more inclined to ask in past elections is this one: what have you done for me lately?